www.nvwah.com is a new website set up by a biochemist to share her chemical knowledge by applying it to cosmetic formulations. The site looks very good but it is very new so although it has lots of products on it already most of the descriptions are very short. So what is it? 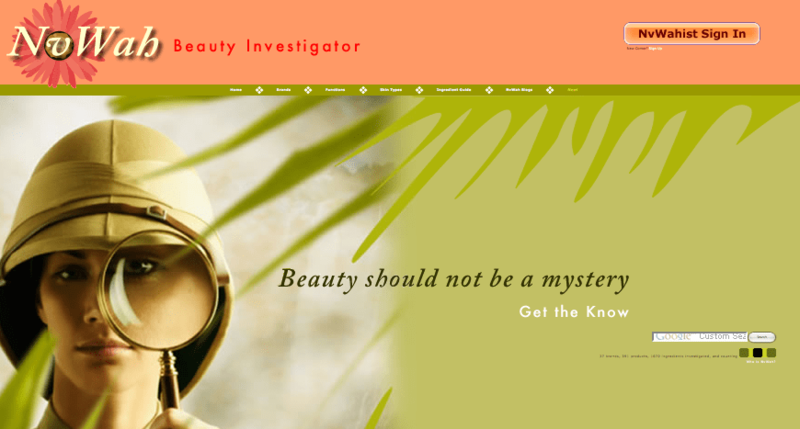 Basically it is an online database of skin products with information about their ingredients. Each one is assessed for its safety and given a star rating out of 5 based on this assessment. The site is impressively easy to navigate and products can be sorted in some interesting ways. The site is a tour de force technically and I can imagine that I will probably be back there to look up information on particular products. I think it needs some more content about the products listed to be interesting enough to hold viewers attention for long, but as It is a new site I expect that will be coming soon. This entry was posted in Beauty News on May 1, 2009 by Colin. Is hard or soft water better for skin?